You have reached Orlando's oldest contracted discount ticket agent for the Walt Disney World Resort, Universal Studios Orlando, Sea World, Kennedy Space Center, Busch Gardens, Orlando Dinner Shows, Water Parks & other Central Florida Attractions! 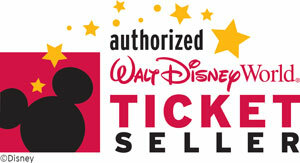 We offer the lowest prices and best values on Disney Tickets. Please don't hesitate to call or email us anytime for questions regarding ticket prices or friendly suggestions for your Orlando vacation. Don't be misled by other discount ticket web sites that advertise artificially lower prices by leaving out the tax. All our ticket prices INCLUDE tax. What you see is what you pay, with no hidden fees, "catches", or timeshare involved. For over 35 years we have been one of Central Florida's most popular and trusted discount ticket agents. Every ticket we sell is guaranteed to be 100% authentic, brand new and unused. Save time and money and purchase your tickets here! Save time and money while avoiding long lines at the gate! All of our ticket prices include sales tax and have no other hidden fees added at check out. We are a contracted and licensed discount wholesaler of Walt Disney World, Universal Studios Orlando™, Busch Gardens, Sea World, the major Orlando dinner show and water park tickets. Have peace of mind knowing that you are working with a proud member of the BBB and the Osceola Chamber of Commerce. Every ticket we sell is new and unused, purchased directly from the attractions. Never purchase used Disney Tickets from places like EBay. Disney will not reimburse you should any issues arise with your purchase of used or 'buy back' tickets with left over days on them. Enjoy peace of mind with any tickets you purchase through our company. You get 100% brand new tickets at the best values you'll find anywhere. Five stars for the business who always makes me save in tickets! In here you always get what expect and sometimes... Even more! My pleasure to make business with you guys! Been buying tickets from here for years-WDW, Universal, Wonderworks etc! They have them all cheaper then anyone and NEVER had any issues at the gates! Excellent prices and quick delivery even to Scotland! Awesome customer service! Went out of their way to get tickets to me on time (with short notice)! Thanks again, and we look forward to using you guys again!! Immerse yourself in wonder at SeaWorld® Orlando, where the aquatic world comes alive. See the world through the eyes of a penguin in the all-new thrilling, chilling adventure of Antarctica: Empire of the Penguin™. Laugh to an all-new sea lion show. Climb aboard and ride the mighty Manta®. Experience the awe-inspiring Shamu® show, One Ocean®. Embark on the epic 3D 360 voyage of TurtleTrek®. There’s an ocean of fun ready to be explored at SeaWorld Orlando. Click here for more info on our Sea World tickets and our Sea World Orlando Choose Your Adventure Packages. Save over $20 on 1 Day LegoLand Tickets! Order today! Immerse yourself in wonder at SeaWorld® Orlando, where the aquatic world comes alive. See the world through the eyes of a penguin in the all-new thrilling, chilling adventure of Antarctica: Empire of the Penguin™. Laugh to an all-new sea lion show. Climb aboard and ride the mighty Manta®. Experience the awe-inspiring Shamu® show, One Ocean®. Embark on the epic 3D 360 voyage of TurtleTrek®. There’s an ocean of fun ready to be explored at SeaWorld Orlando.